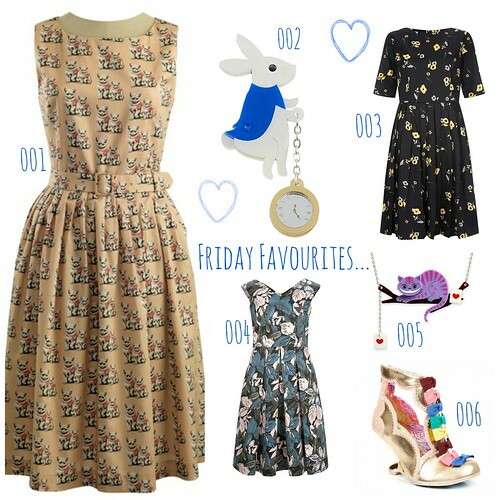 t*rexes and tiaras: Friday Favourites 170.. So many pretty things catching my eye this week. Everywhere I look, it's Christmas this and Christmas that. But, since I've done all of my shopping for other people already, I've been steadily adding things to my own wishlist. I've had my heart set on just about any / all of the Rachel Riley dresses - so many pretty prints, but I think this cat print one (001) is my current favourite. Speaking of lovely dresses, People Tree seem to have come up trumps with pretty dresses lately; I love just about everything in their Winter Florals range. The Ramona (003) and the Abby (004) would be welcome additions to my wardrobe, for sure. My current favourite Irregular Choice heels have got to be these (006). Gem styled the red version of Truly Scrumptious recently and I love them, but I think I like the multi-coloured bows on the gold version even more. Last but not least, Little Moose, who are possibly my favourite jewellery company of recent times. They have recently launched their Alice in Wonderland range, and frankly I'd like one of everything, please. Oh my!!! I'd love that bunny too!!! The whole Alice collection is frankly amazing! Me too, it's so hard to choose!